We provide commercial, construction, and residential cleaning of windows, awnings, gutters, lights, mirrors and ceiling fans. 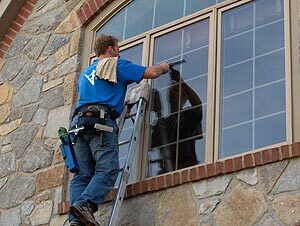 Integrity, scheduling dependability, and our unequalled customer service, enable us to complete any window cleaning requirements that you might have in an unobtrusive, professional manner. We Exist to Serve! Call for a prompt quote or consultation on your window cleaning needs. Master Window Cleaning. All rights reserved. Proudly designed and hosted by Big Sky Internet Design.